Maria Theresa Walburga Amalia Christina (German: Maria Theresia [maˈʀiːa teˈʀeːzi̯a]; 13 Mey 1717 – 29 November 1780) wis the anly female ruler o the Habsburg dominions an the last o the Hoose o Habsburg. 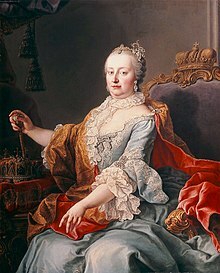 She is generaly known as Empress Maria Theresa. Airchduchess Maria Elisabeth o Austrick (1737–1740) died childless. Airchduchess Maria Anna o Austrick (1738–1789) died childless. Airchduchess Maria Carolina o Austrick (1740–1741) died childless. Joseph II, Haly Roman Emperor (1741–1790) mairit (1) Princess Isabella o Parma then (2) Princess Maria Josepha o Bavarie an had childer. Airchduchess Maria Christina o Austrick (1742–1798) mairit Prince Albert Casimir August o Saxony, Duke o Teschen but died childless. Airchduchess Maria Elisabeth o Austrick (1743–1808) died childless. Airchduke Charles Joseph o Austrick (1745–1761) died childless. Airchduchess Maria Amalia o Austrick (1746–1804) mairit Ferdinand o Parma, Duke o Parma an had childer. Airchduchess Maria Johanna Gabriela o Austrick (1750–1762) died young. Airchduchess Maria Josepha o Austrick (1751–1767) died childless. Airchduchess Maria Carolina o Austrick (1752–1814) mairit Ferdinand I o the Twa Sicilies an had childer. Airchduke Ferdinand o Austrick, Duke o Breisgau (1754-1806) mairit Maria Beatrice d'Este, Duchess o Massa an had childer. Airchduchess Maria Antonia o Austrick (Marie Antoinette) (1755–1793) mairit Louis XVI o Fraunce an had childer. ↑ As she wis the seicont Maria tae reign ower the Austrick Netherlands (efter Mary the Rich) an Hungary (efter Mary o Anjou), she is sometimes leetit as Maria II Theresa. Ellenius, 210. This page wis last eeditit on 13 Apryle 2019, at 19:53.